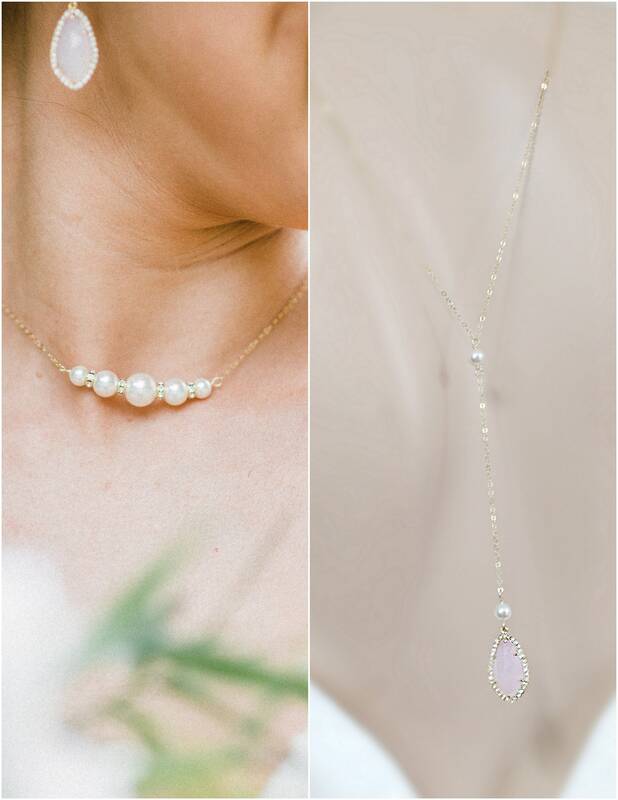 Did you choose a open back wedding dress and now looking for a delicate backdrop necklace to accessorize it? 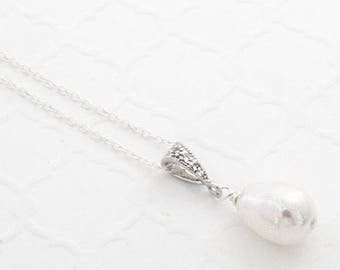 Well, this dainty pearl wedding necklace is just what you need! It is made of a light weight chain (Sterling Silver or Gold Filled), which is the go to even if you have sensitive skin. The front of the necklace has graduated Swarovski pearls with crystal spacers just to add a bit of spark. The back drops down and ends with a gorgeous framed blush glass teardrop. 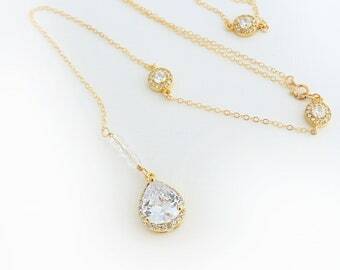 This necklace is simple, but yet so elegant and it's so comfy you won't even feel it's there. This gorgeous necklace has been made with CRYSTALLIZED™ - Swarovski Elements Pearls. Most components are solid Sterling Silver or Gold Filled. Pink teardrop is in gold/silver plated frame with cubic zirconia. Necklace is 25 inches plus 6 inches of the backdrop. It does not have a clasp, you can just slip it over your head. If different size is needed please leave instructions at checkout. Sign up to my VIP List and get 10% OFF your first order! I ship within 2 to 5 business days except for some custom or larger orders which can take up to 2 weeks. Beautiful and dainty. It'll go perfectly with my wedding dress! I loved the necklace so much that I ordered the earrings to go with it. Earrings are made exceptionally well. The earrings are heavier than anticipated, but look beautiful. I want happy customers and I'm completely confident that you will LOVE your jewelry. If for any reason the item arrives damaged or it doesn't match the description, I will replace the item if contacted within 3 days of delivery. Please note that for hygienic reasons Earrings are NOT eligible for returns. I'm sure you would like to be confident that you will receive a new, unused pair of earrings and therefore I won't be jeopardizing this security. Make sure you read the whole description and feel free to message me if you are unsure of something Before buying. All my listings include detailed information of sizes and several pictures to display the jewelry. Necklaces and Bracelets may be returned if contacted within 3 days of delivery and postmarked within 5 days of delivery. No exceptions! 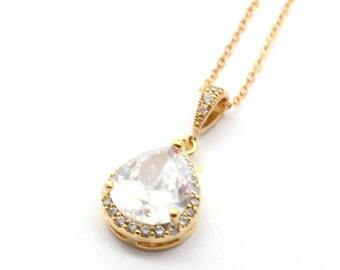 The item must be in the original condition: undamaged, safely packaged, no signs of wearing, etc. Remember that each item is hand made just for you and can take hours (even days) to make, therefore there will be a 20% fee when refunding any necklace or bracelet. Custom or personalized orders are not eligible for return/exchange. Custom is considered any item where you choose/request a size, length, color or customized in any other manner. Orders of two items or more of the same design is considered custom and therefore can't be returned/exchanged. If you are unsure please consider buying only one first. Under no circumstances will returns/exchanges be accepted after your wedding/event date. CURRENTLY SHIPPING WITHIN 1 WEEK, usually faster. All items will be shipped First Class mail without insurance unless requested before payment. If you need another form of shipment, please contact me before paying so I can send you a revised invoice for the difference in the cost. Please review your Etsy and PayPal address before making the payment. I will ship to your Etsy address automatically. All the items will be carefully packed so that they arrive safe to your destination. You will receive your jewelry in cotton filled jewelry boxes with ribbon, ready for gift giving. Any customs duties, taxes, fees, etc are the buyer's responsibility and are not reflected in my shipping charges. You will be responsible for any customs related subject. I will ship USPS First class with a customs declaration form. This does not include any insurance or way of tracking. If you want it to include tracking or upgrade to a secure shipping please notify me before paying so I can add the extra cost to the shipping cost. International delivery varies and can take up to 8 weeks (even 3 months to some countries), but usually will arrive between 3 to 6 weeks after shipment. Please also note that it's the buyers responsibility to check if the item ordered is allowed to be imported into his/her country. Anything worth £15+ which is imported to the UK from a non-EU country will be charged importing fees @ 20%, plus an additional £8 handling fee in order for the package to be released at CUSTOMS. This is not my charge and therefore I won't be involved in this payment, it is your country who will be collecting and keeping the whole charge. Customs in your countries are getting more and more strict and in many cases they're going to charge you importing and processing fees. Additionally they might ask you to come and pick up from their offices. This will be the case of any package (not just from my shop) and I can't have any kind of control over this. Please keep delays and additional charges by your country in mind when buying from international shops. Please be aware that I can't be held responsible for any Post Office mistakes, delays or losses, since I don't have any control over that. If you have any post office issues contact me and I will do my best to help you solve it. Any special orders, questions, gift requests or ideas? Please contact me through the Etsy "contact seller" application. I try to respond within 1 business day. I placed a large order of multiple items, will it also ship within 5 days? Larger orders or custom orders might take me a bit longer to finish. Please allow up to 2 weeks for me to finish them. I need my order right away. Can you make it faster? If you need your order by a certain date please contact me before purchasing. Most of the time I can accommodate and work a bit longer to finish your item(s) sooner. I do recommend that in this case you upgrade to Priority Mail or Priority Mail Express shipping to make sure you get your item(s) in time, otherwise I ship via First Class mail which can take up to 10 days to deliver in the US. Which Express Shipping options do you offer? Does it have an extra cost? Both have an extra cost and you can add them to your listings by going to the "Shipping Upgrade" section in my shop. What is the size of the jewelry? Sizing of each jewelry piece is described in the individual listing. If you are a mobile user make sure to expand the "Item Details" section. Do you offer customizations and personalizations on your jewelry? Yes, I do! Please convo me for details. Please just note that custom orders are non refundable and can't be exchanged. All my items come in cotton filled jewelry boxes with ribbon. They are ready for gift giving! Are you on Social Media? How can I stay connected? How can I send a picture wearing your pieces? Also feel free to tag me in your pictures @estylojewelry Please keep in mind that Instagram will show only the last 100 interactions and unless you tag me in your photo it is very likely that I could miss it if you just mention me. I look forward in seeing your beautiful pictures! Most items are shipped within 2 to 5 business days of being paid. Some items require however more time, so please check the specific item for accurate timeframe.